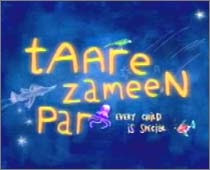 Actor Aamir Khan's directorial debut Taare Zameen Par has been selected as India's entry for the Oscar 2009 in the best foreign film category, impressing the jury with its "perfection" in all aspects of filmmaking. Taare Zameen Par is the final choice because it has a universal appeal and it has all the elements that make a good film, in terms of its production value, script, concept and story," filmmaker Sunil Darshan said here on Saturday. Darshan is the chairman of the 10-member jury set up by the Film Federation of India (FFI). The movie was jointly produced by Aamir Khan Productions and PVR Pictures and starred Darsheel Safary as the protagonist. It it the story of an eight-year-old dyslexic boy and a teacher, played by Aamir, bringing the kid out of his predicament. The other Bollywood films in competition were, A Wednesday, Rock On, Mumbai Meri Jaan, Jodhaa Akbar, Black & White - all of which have won critical acclaim. There were also two Marathi films Tingya and Vaalu and a Telegu film Gamyam in contention. Vaalu has a fantastic screenplay and Tingya has a good and sound script. It is not that other films were bad, but Taare Zameen Par stood out among others, Darshan added. Another jury member Mahesh Kothare, a Marathi filmmaker and actor, was all praise for the selected film. As a jury, we had two basic intentions - that the chosen film must have a good chance of winning an Oscar and secondly, that it should meet certain parameters for an Oscar. These are content and cinematic excellence. Taare Zameen Par has it all. It has been made so perfectly. There is perfect direction, animation, screenplay, acting, script, and so there is no reason why it shouldn't have been choosen, said Kothare. He also exuded confidence that the film will finally bring India an Oscar in 2009.